The fourth commandment gives us very specific instructions on how to remember the Sabbath day. Six days a week are given to us, to labor and work and create. We are made in the image of a Creator, and He has given us dominion over all the works of His hands. “So God created man in His own image; in the image of God He created him; male and female He created them. Then God blessed them, and God said to them, ‘Be fruitful and multiply; fill the earth and subdue it; have dominion over the fish of the sea, over the birds of the air, and over every living thing that moves on the earth‘” (Genesis 1:27-28). “Then YHVH God took the man and put him in the garden of Eden to tend and keep it” (Genesis 2:15). “You have made him to have dominion over the works of Your hands; You have put all things under his feet, all sheep and oxen— even the beasts of the field, the birds of the air, and the fish of the sea that pass through the paths of the seas” (Psalm 8:6-8). Our work is fulfilling. To create is very enjoyable, and to tend and keep is to feel like our life has purpose. Our work provides food, and we make the world a better place. But one day a week is to be set apart for YHVH. On this day, we look up at the Creation God has made, and we remember that we are but dust. “When I consider Your heavens, the work of Your fingers, he moon and the stars, which You have ordained, what is man that You are mindful of him, and the son of man that You visit him?” (Psalm 8:3-4). Suddenly we are instructed to cease from our work – to shabbat. No longer are we the creators, the masters of our little universe. On this day, as we don’t work or allow others to work for us, we are dependent upon the Creator alone. The people of Israel were gathered at the base of Mount Sinai two months after they had been brought out of Egypt as slaves. They had known nothing but slavery. Now YHVH wanted to make them into a nation of free men. “‘These are the words which you shall speak to the children of Israel'” (Exodus 19:1-6). The children of Israel made a covenant with YHVH on this day. YHVH wanted to make them a set-apart nation, set apart just as He is set apart. He wanted to make them into a special treasure, above all other people and nations on earth – and all the earth was His, so He could certainly do this! “So Moses came and called for the elders of the people, and laid before them all these words which YHVH commanded him. Then all the people answered together and said, ‘All that YHVH has spoken we will do.‘ So Moses brought back the words of the people to YHVH” (Exodus 19:7-8). The Ten Commandments are not the entire covenant made with Israel that day, but they are repeated several times in the Torah as the summary of the covenant. At the end of YHVH’s covenant stipulations with Israel, He gave them the sign of the covenant. “‘”Surely My Sabbaths you shall keep, for it is a sign between Me and you throughout your generations, that you may know that I am YHVH who sanctifies you. You shall keep the Sabbath, therefore, for it is holy [set apart] to you. Everyone who profanes it shall surely be put to death; for whoever does any work on it, that person shall be cut off from among his people. Work shall be done for six days, but the seventh is the Sabbath of rest, holy [set apart] to YHVH. Whoever does any work on the Sabbath day, he shall surely be put to death. “And when He had made an end of speaking with him on Mount Sinai, He gave Moses two tablets of the Testimony [or covenant], tablets of stone, written with the finger of God” (Exodus 31:12-18). You can think of this “sign” as a wedding ring. As a bride wears a wedding ring, she is reminded of the covenant she has made with her husband. As Israel remembered the Sabbath each week, they were reminded of the Covenant made with YHVH. They would remember that they were a set-apart nation. Just as Sabbath came every seven days, week in and week out without fail, so would their covenant stand before YHVH before all generations. The Sabbath would be the sign between them, their wedding ring, forever. Hold everything! When I was reading through my Bible in 2006, I tried to stay very aware of who commands were given to. “‘Surely My Sabbaths you shall keep, for it is a sign between Me and you throughout your generations, that you may know that I am YHVH who sanctifies you. You shall keep the Sabbath, therefore, for it is holy to you. Everyone who profanes it shall surely be put to death; for whoever does any work on it, that person shall be cut off from among his people. Work shall be done for six days, but the seventh is the Sabbath of rest, holy to YHVH. Whoever does any work on the Sabbath day, he shall surely be put to death. “‘Therefore the children of Israel shall keep the Sabbath, to observe the Sabbath throughout their generations as a perpetual covenant. It is a sign between Me and the children of Israel forever; for in six days YHVH made the heavens and the earth, and on the seventh day He rested and was refreshed.”‘ (Exodus 31:12-17). I am not a Jew. As far as I know (and I have records of my genealogy back to the 1500s), I have no ties to Israel anywhere in my family tree. I have some German, some Swedish, some English, Irish, and Scottish – but I as far as I’m aware, I am not one of the children of Israel. Back in 2006, when an acquaintance came to a conference to hear me speak and then pulled me aside to thank me for my high opinion of keeping God’s Law, I bristled and pulled away from her. I had recently written a book for women and I was a frequent blogger, and this friend had read my claim that Ephesians was my favorite book of the Bible. She encouraged me to go home and read the book of Ephesians again. You can imagine my surprise when the Spirit of God opened my eyes to something that had been in Ephesians all along. “Therefore remember that you, once Gentiles in the flesh—who are called ‘Uncircumcision’ by what is called the ‘Circumcision’ made in the flesh by hands— that at that time you were without Messiah, being aliens from the commonwealth of Israel and strangers from the covenants of promise, having no hope and without God in the world” (Ephesians 2:11-12). You remember what the “Uncircumcision” and the “Circumcision” are, right? In the first century, Judaism taught that unless a person was properly trained in the Torah and brought through all the special training dictated by the Sages, this person could not become a citizen of Israel. He was “uncircumcised,” a Gentile “dog” with whom a Jew could not even eat. You also remember that this was not God’s plan, right? The same Torah was for the Israelite and the foreigner, and the Prophets foretold that the Gentiles would seek YHVH. In fact, all who called upon the name of YHVH could be saved! But from a first-century believer’s perspective, especially a Gentile who lived in the city of Ephesus, he would be a foreigner from the commonwealth of Israel. He would be a stranger from the covenants of promise. He would have no hope of a Messiah. He was without God in the world. “But now in Messiah Yeshua you who once were far off have been brought near by the blood of Messiah. For He Himself is our peace, who has made both one, and has broken down the middle wall of separation, having abolished in His flesh the enmity, that is, the law of commandments contained in ordinances, so as to create in Himself one new man from the two, thus making peace, and that He might reconcile them both to God in one body through the cross, thereby putting to death the enmity. And He came and preached peace to you who were afar off and to those who were near. For through Him we both have access by one Spirit to the Father” (Ephesians 2:13-18). The blood of Messiah abolished the wall of separation between Jew and Gentile. There were signs posted on the soreg in Greek and in Latin that warned unauthorized people against entering the area of the Holy Temple. The signs warned that anyone who went beyond the soreg was “liable.” These signs were similar to our “No Trespassing” signs today. You can see one of these marble tablets in the Israeli Museum in Jerusalem. When the Greeks invaded the Temple [Antiochus Epiphanes and the story of Hanukkah], they broke 13 breaches in the soreg as a sign of their contempt for Jewish law. When the Hasmoneans defeated Antiochus and purified the Temple, the religious rulers of the day decided to leave those breaches open. Richman said that when the Jews started going back to the Temple, they would lay themselves on the ground and offer thanks to God for the miracle of the defeat of the Greeks at the hand of the Hasmoneans. Our sin does indeed make us unclean, and because of our sin, we may not enter the presence of a holy God. Sin, or the transgression of the Torah, carries with it the death penalty, which Paul called “the law of commandments contained in ordinances.” The law contained in ordinances said that the soul that sins, it shall surely die (Ezekiel 18:4). This is why the shed blood of Yeshua is considered “good news”! Because He took our death penalty upon Himself, we are no longer considered the enemies of God. He has made reconciliation between God and man, and all who have had the blood of Yeshua applied to their lives may now approach Him with confidence. This also destroys the enmity between Circumcision and Uncircumcision, between Jew and Gentile. The wall of separation has been abolished, and only peace remains. “Now, therefore, you are no longer strangers and foreigners, but fellow citizens with the saints and members of the household of God, having been built on the foundation of the apostles and prophets, Yeshua the Messiah Himself being the chief cornerstone, in whom the whole building, being fitted together, grows into a holy temple in YHVH, in whom you also are being built together for a dwelling place of God in the Spirit” (Ephesians 2:11-22). We are now fellow citizens with Israel! Even though we may be Gentile by birth, we can be members of the household of God by faith in Yeshua. In fact, we are members of a new and better covenant. You see, we have already learned that the covenant made with Israel at Sinai was a perpetual covenant, a sign between YHVH and the children of Israel forever. This covenant came with conditions. If Israel would obey, YHVH would shower them with blessings. If they broke the covenant, however, He would shower them with curses. “Moses rose early in the morning and went up Mount Sinai, as YHVH had commanded him; and he took in his hand the two tablets of stone. Now YHVH descended in the cloud and stood with him there, and proclaimed the name of YHVH. “And YHVH passed before him and proclaimed, ‘YHVH, Adonai Elohim, merciful and gracious, longsuffering, and abounding in goodness and truth, keeping mercy for thousands, forgiving iniquity and transgression and sin, by no means clearing the guilty, visiting the iniquity of the fathers upon the children and the children’s children to the third and the fourth generation..
“‘Behold, I make a covenant. Before all your people I will do marvels such as have not been done in all the earth, nor in any nation; and all the people among whom you are shall see the work of YHVH. For it is an awesome thing that I will do with you. Observe what I command you this day. “So he was there with YHVH forty days and forty nights; he neither ate bread nor drank water. And He wrote on the tablets the words of the covenant, the Ten Commandments” (Exodus 34:4-7, 10-16, 27-28). We can read of the specific curses and blessings in Leviticus 26 and Deuteronomy 27-30. Of course, we know that Israel did not keep the covenant. Not only did she not keep the Sabbath, but she also made a covenant instead with the inhabitants of the land of Canaan, falling into idolatry by worshiping their false gods. As the covenant stated, if they would not obey, YHVH promised to thrust them out of the Promised Land and scatter them from one of the earth to the other, bringing on them all the curses stated in the scroll of the covenant. Thankfully, YHVH always upholds His side of a covenant. Part of His promise was that He would chase after His bride and restore her, no matter how adulterous she became. “Now it shall come to pass, when all these things come upon you, the blessing and the curse which I have set before you, and you call them to mind among all the nations where YHVH your God drives you, and you return to YHVH your God and obey His voice, according to all that I command you today, you and your children, with all your heart and with all your soul, that YHVH your God will bring you back from captivity, and have compassion on you, and gather you again from all the nations where YHVH your God has scattered you. If any of you are driven out to the farthest parts under heaven, from there YHVH your God will gather you, and from there He will bring you. “Then YHVH your God will bring you to the land which your fathers possessed, and you shall possess it. He will prosper you and multiply you more than your fathers. And YHVH your God will circumcise your heart and the heart of your descendants, to love YHVH your God with all your heart and with all your soul, that you may live” (Deuteronomy 30:1-6). “‘Behold, the days are coming,’ says YHVH, ‘when I will make a new covenant with the house of Israel and with the house of Judah— not according to the covenant that I made with their fathers in the day that I took them by the hand to lead them out of the land of Egypt, My covenant which they broke, though I was a husband to them,’ says YHVH. “’If those ordinances [the sun, moon, stars, and sea] depart from before Me,’ says YHVH, ‘then the seed of Israel shall also cease from being a nation before Me forever'” (Jeremiah 30:3; 32:31-36). The terms of the “new” covenant are the same: Israel would still keep the Torah, except this was an unconditional covenant between YHVH and Israel. He would write the Torah on their hearts, enabling them to obey, so that they would never cease to be a nation before Him again. In fact, did you notice that the sign of the new covenant involves going out to look at the sun, moon, stars, and mighty ocean again? Each week, on the day Israel was to rest and remember the Creator of the sun, moon, and stars, they would now be able to remember His promise, His new covenant, that they would never cease to be a nation. Ever. “Thus says YHVH God: ‘Surely I will take the children of Israel from among the nations, wherever they have gone, and will gather them from every side and bring them into their own land; and I will make them one nation in the land, on the mountains of Israel; and one king shall be king over them all; they shall no longer be two nations, nor shall they ever be divided into two kingdoms again. They shall not defile themselves anymore with their idols, nor with their detestable things, nor with any of their transgressions; but I will deliver them from all their dwelling places in which they have sinned, and will cleanse them. Then they shall be My people, and I will be their God. “’David My servant shall be king over them, and they shall all have one shepherd; they shall also walk in My judgments and observe My statutes, and do them. Then they shall dwell in the land that I have given to Jacob My servant, where your fathers dwelt; and they shall dwell there, they, their children, and their children’s children, forever; and My servant David shall be their prince forever. “’Moreover I will make a covenant of peace with them, and it shall be an everlasting covenant with them; I will establish them and multiply them, and I will set My sanctuary in their midst forevermore. 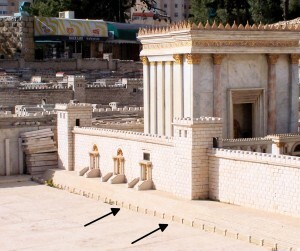 My tabernacle also shall be with them; indeed I will be their God, and they shall be My people” (Ezekiel 37:21-27). Yeshua says that His blood was shed so that the new covenant could be ratified. “Then [Yeshua] took the cup, and gave thanks, and gave it to them, saying, ‘Drink from it, all of you. For this is My blood of the new covenant, which is shed for many for the remission of sins'” (Matthew 26:27-28). Paul told the Gentile believers to remember this covenant. “The Master Yeshua on the same night in which He was betrayed took bread; and when He had given thanks, He broke it and said, ‘Take, eat; this is My body which is broken for you; do this in remembrance of Me.’ In the same manner He also took the cup after supper, saying, ‘This cup is the new covenant in My blood. This do, as often as you drink it, in remembrance of Me.’ For as often as you eat this bread and drink this cup, you proclaim the Master’s death till He comes’ (1 Corinthians 11:23-26). Yeshua’s blood allows Him to mediate a new covenant for the House of Israel, and indeed, for all who will call on the name of YHVH. “He is also Mediator of a better covenant, which was established on better promises. For if that first covenant had been faultless, then no place would have been sought for a second” (Hebrews 8:6-8). What kind of fault was found with the first covenant? Was the fault found with YHVH? No, for He upheld His end of the covenant! Was the fault to be found with the commands and instructions? How could this be, for YHVH says that He gave them His commands for their good! “And now, Israel, what does YHVH your God require of you, but to fear YHVH your God, to walk in all His ways and to love Him, to serve YHVH your God with all your heart and with all your soul, and to keep the commandments of YHVH and His statutes which I command you today for your good” (Deuteronomy 10:12-13). No, the fault in the covenant was found with the Bride, with Israel who ran away and committed adultery with idols and who did not keep the commandments of YHVH her God. “In that He says, ‘A new covenant,’ He has made the first obsolete. Now what is becoming obsolete and growing old is ready to vanish away” (Hebrews 8:9-13). The law of God did not become obsolete; rather, the covenant became obsolete, because Israel would not continue in it. The good news is that there is a new covenant! As I continued to read through the book of Ephesians, I found out that Paul was as surprised about this as I was! It was one thing for God to make a new covenant “with the house of Israel and with the house of Judah.” It was quite another for a Gentile to be included in that covenant! “For this reason I, Paul, the prisoner of Messiah Yeshua for you Gentiles… how that by revelation He made known to me the mystery… that the Gentiles should be fellow heirs, of the same body, and partakers of His promise in Messiah through the gospel” (Ephesians 3:1-6). It was quite a surprise to Paul, and indeed, to all the Apostles of the Master, but it was not a surprise to YHVH. He had told the prophet Isaiah about this hundreds of years earlier. “Incline your ear, and come to Me. For He has glorified you” (Isaiah 55:3-5). So how does a Gentile, a foreigner to the covenant, join himself in covenant with the God of Israel? We start where the Apostles told the first believers to start, by turning from their idolatry and meeting together on the Sabbath day, to learn as the Torah of Moses is read. “We write to them to abstain from things polluted by idols, from sexual immorality, from things strangled, and from blood. For Moses has had throughout many generations those who preach him in every city, being read in the synagogues every Sabbath” (Acts 15:20-21). Can we suppose that we who are not Israel may meet on “the Jewish Sabbath”? Is that day really for us as well? “For thus says YHVH: ‘To the eunuchs who keep My Sabbaths, and choose what pleases Me, and hold fast My covenant, even to them I will give in My house and within My walls a place and a name better than that of sons and daughters; I will give them an everlasting name that shall not be cut off. “YHVH God, who gathers the outcasts of Israel, says, ‘Yet I will gather to him others besides those who are gathered to him‘” (Isaiah 56:3-8). And now we’ve come full circle. The mystery is that the Gentiles may come into Covenant with the God of Israel, and the first way they show that they want to partake of the Covenant is by remembering the Sabbath day. You can read the entire covenant, with all of the instructions which the people covenanted to do, in Exodus 20-31 and repeated in Deuteronomy and Joshua 24. « Choose: Sabbath or Idolatry! Hi , I want to thank you so much for writing this article . I have been pondering this for some time but didn’t bring it al together …. this just conformed I am hearing from Yeshua and right where I need to be …Thank you !!! I found it interesting that you called the Sabbath, “the Jewish Sabbath” and also said, “Suddenly we are instructed to cease from our work – to shabbat.” (I think referring to when the 10 commandments were given at Sinai. The Sabbath (the seventh day of creation, now known as Saturday) was given many many many years before God’s people were known as Jews. It says in Genesis 2:3 that “God blessed the seventh day, and sanctified it: because that in it he had rested from all his work which God created and made.” The 4th commandment hearkens back to when the Sabbath was given in the beginning. Just a thought. Oh, I agree completely! 😉 Yes, it is often called the “Jewish” Sabbath, but Scripture is clear that the Sabbath was given (as were all of His instructions, the Torah) for ALL of the earth (Psalm 105:7, Isaiah 24:5, Isaiah 42:1,4). Thank you, Trudi! Hi Anne, from what I’ve read, ref your explanation of the Sabbath, I can see your heart is toward Our Father. As you probably know there are ‘deeper’ meaning in the Scriptures than what we see on the surface. Like when it says that Jesus was born in a stable because there was no room for them at the inn. (Luke 2:7). Yet the deeper meaning was that Jesus was/is The Lamb of God. And stables are where lambs are born. May I give you another point of view concerning the Sabbath and why Our Father brought it about? Adam (mas) was created at the end of the sixed day and lived in the seventh. As Genesis 2:1,2 says God finished His work and rested! Not because He was tired, but because “ it is finished”. Adam (man) was to live in the seventh (Sabbath) apart from providing for himself through the sweat and toil. That was before Adam committed treason and sold out to the devil. That’s when God told him that the earth was now cursed because of him and basically said that his provision would only come through sweat and toil. (Genesis 317-19. But God, in His Love and mercy for man gave him a picture (if you will) through the Sabbath day of what still in man’s future. Hebrews 4:9-11 says that there still remains a rest (Sabbath rest) to the people of God and man can enter that rest. Then, if you look at Colossians 2:16,17 it says that The Sabbath is a shadow of things to come (the rest God has for man), but the reality is Jesus Christ.